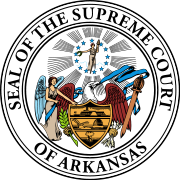 The Arkansas Supreme Court is the highest court in the U.S. state of Arkansas. Since 1925, it has consisted of a Chief Justice and six Associate Justices, and at times Special Justices are called upon in the absence of a regular justice. The Justices are elected in a non-partisan election for eight-year-long terms that are staggered to make it unlikely that the entire court would be replaced in a single election. Any vacancy caused by a Justice not finishing his or her term is filled by an appointment made by the Governor of Arkansas. Under the state's first constitution, the Arkansas Supreme Court consisted of three judges including one Chief Justice, and all three of whom were elected by the Arkansas General Assembly. The first judges elected to the court by the Assembly were Daniel Ringo as Chief Justice (who served from 1836 to 1844), Townsend Dickinson (who served until 1842), and Thomas J. Lacy (whose term lasted until 1845). No change to the court's size occurred after Reconstruction, but the Arkansas Constitution of 1874 was amended in 1924 (Amendment 9) to add two more judges and allow the Assembly to increase the number to seven, which it did a year later by Act 205 of 1925.